In Part 1 of the GTD with Outlook 2010 and OneNote 2010 Series, I covered the high level overview of my GTD system. This post will focus on getting Outlook 2010 setup appropriately so you can start processing, organizing and doing with Outlook and OneNote. The first thing we’ll cover is setting up our Next Action contexts. In the GTD methodology, contexts are used to break up our Next Actions into distinct areas where we actually “do” our Next Actions, such as @Computer, @Home, @Phone, etc. In Outlook, we can use the Categories feature (introduced in Outlook 2007) to break our Next Actions up into these contexts. It’s very easy to customize Categories, and here’s how to do it. 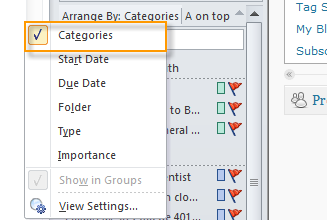 Start by clicking the Categories button in the Tags section of the Outlook ribbon. Select All Categories… from the drop down menu. Unless you have customized these previously, your Categories will be populated with quite a few pre-created categories. These work for some, but what I end up doing is deleting all of them. Yes, ALL OF THEM. 🙂 But don’t worry, we’ll create our own custom categories and we’ll always have the option of refining these later by creating new categories, modifying them or deleting them. Here’s what my Categories looks like. You’ll notice I have two distinct groupings; Those that start with the @ symbol and those that start with “Contacts’”. I like to categorize my contacts, and if you do to, feel free to create some Contact categories. However, right now, we are focusing on our Next Action categories, and you guessed it, these start with the @ symbol. Now, you’ve seen my Categories, and these work for me. One of the great things about GTD is it’s flexibility to fit an individual, and you can create different categories to fit your individual needs. I personally like to keep mine as simple as possible, and I’ve narrowed mine down to a set that fits my needs pretty well. Let’s get into how to create our categories! If you are like me, you’ll want to start with a clean slate. You can skip this step if you are apprehensive about deleting anything, and go watch an episode of Hoarders…maybe you have some electronic hoarding tendencies…just kidding. 🙂 There is no bulk way of going about this, so select a category, click the Delete button and confirm the deletion by pressing the OK button in the dialog box that pops up. It’s ok, these can always be created again! Once you have a clean slate, let’s get started creating our Categories to match our GTD contexts. To create a category, click the New… button, type a name for the category (I like to begin mine with the @ symbol, which keeps them at the top if I have other categories listed. Next, select your favorite color (chartreuse, periwinkle, gray…). 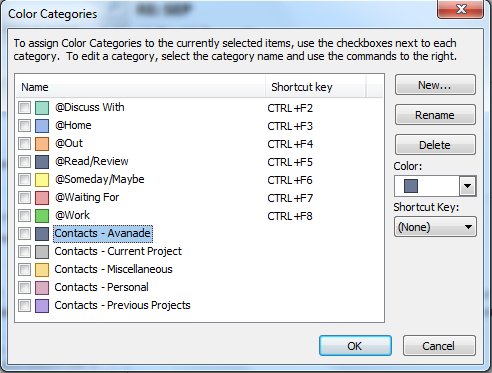 You also have the option of assigning a shortcut key from CTRL + F2 to CTRL+ F12. If you find this makes you more productive and you don’t like using the mouse if you don’t have to, then these shortcuts are for you. Click OK when you are done. Alright, first category down. Repeat the steps above to create the rest of your categories. Remember these categories represent your Next Action contexts. You may already have context that you use, or you may be starting out for the first time. If you are starting out for the first time, my suggestion is to start simple. More contexts can always be included in your system as you refine it and fit it to your liking. With this GTD implementation, Next Actions are created, reviewed, organized and completed in Outlook 2010. 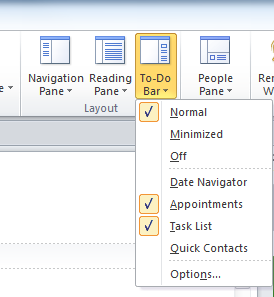 One of the key features that help us with these tasks was introduced back in Outlook 2007 and is called the Outlook To-Do bar. Folks, if you haven’t been introduced to the To-Do bar, then allow me. To-Do bar, folks, folks, this is To-Do bar. As you can see to our right, the To-Do bar shows upcoming calendar appointments on top, and tasks arranged by categories beneath the appointments. Now, before you ask, I’m sure my To-Do bar looks a tad different than yours, or isn’t shown at all. That’s ok, because I’m going to show how to modify your layout to show the To-Do bar, and customize the To-Do bar to your liking. First, the To-Do bar isn’t any good if we can’t see it. So to get this bad-boy out in the limelight, let’s do the following. First, go to the ribbon up top (where all the fancy icons are) and choose the View tab. In the Layout section, select to To-Do bar drop-down button and make sure the Normal option is selected. Now we have our To-Do bar front and center…err…right. Ok, now we have our To-Do bar customized, we have one last step to make sure it’s displaying correctly for our GTD system. The To-Do bar may organize your tasks by start-date or due-date by default. This isn’t the best sorting option for our GTD system, so we’ll organize it by Categories. This breaks our Next Actions into the proper contexts we’ve assigned them. 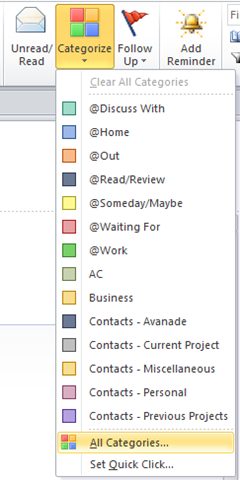 Our in strict Outlook speak, this sorts our To-Do items (tasks, flagged mail, etc.) by category. To do so, click on the left column header in the To-Do bar and select the option for Categories. It’s magical. Ok, I’ve covered the basic setup for getting Outlook ready for Getting Things Done. I have a few more advanced setup tricks to cover and I will detail these when we get to processing our inbox in an upcoming post…aren’t you excited? Before I go, I want you to think for a moment about how you organize your mail. We all in some way or another create a folder structure that works for us as individuals. This could be as simple as one folder for email we’ve read (some use the Trash) or as elaborate as complex nested groups of folders and sub-folders to organize and categorize our mail. When using Outlook with GTD, our folders are there for one thing. Keeping reference material. In many business environments, this could mean ALL mail is kept for compliance and audit trails, but it is still reference material (some day I may need this email…). I urge you to think about, or even rethink how you organize your email, and setup a system that works for you. I’ve gone from a very complex system to a rather simple system, and this decision is primarily based on Outlook 2010 enhancements. The search and indexing features are phenomenal, so I find I don’t have to file email sent to me by a certain person, or about a certain subject. I can simply type in a word or two, maybe the sender’s name and what the email was about, and generally I can find the email I was looking for in a matter of seconds. A second feature, called search folders, allows me to setup pre-defined search criteria, and these folders are populated with email that meets the search criteria. Now I can dump the thousand emails for one project into a single project folder, and if I need to, use Search Folders to dynamically group mail as I see fit. I’ll cover these features as we get into the processing and organizing posts, but for now, if you don’t have an organizational system for email, or you are thinking yours are too complex, keep in mind that simple is often better, and new features in Outlook only make it easier for you to file your email efficiently, and find it again quickly. In the next post we’ll get OneNote setup for our system, so we can get busy and use our tools to actually DO stuff instead of reading ridiculously long-winded blog posts. I was searching to see if GTD had updated their software for Outlook 2010, and ran across your Blog. I am a Microsoft Partner, and have been using all the 2010 Beta Applications and now the real thing for the past couple of months. I’ve been doing the GTD System for several years. And like you have deviced a way to integrate OneNote and Outlook for the majority of my system. I’m always trying to improve and modify the system. Since I am an Electrical Contractor, I’m involved in many “projects”, physical and mental. We are a national contractor, and also do some international projects. So, my life is extremely complicated, with many things to keep track of. So I try and make my system as simple as possible. But one of the major requirements for my system is a weekly review and plannig session. This ususally cannot be done in less than an hour, and usually takes two. So, I generally do it on Sunday evening, planning for the next week and beyond. I’m glad I was lucky enough to find your blog. It is now logged in my favorites, and I’m going to try and use your information to make improvements to my own system. Thanks for reading Steve. It’s good to see some more Outlook/OneNote GTD users out there! Great blog… I am actually a MIcrosoft employee in DUblin Ireland… and ran across your blog.. I am new to GTD but my biggest issue is linking my NExt actions to subprojects and objectives.. I find myself sometimes creating a new action that is already there because I dont get an eas view of the linkages of what is already there? Iam willing to get an add-in for outlook but havent seenanything on the market.. Any suggestions? Great blog and nice job promoting our product.. I have an IPAQ 110 that syncs Contacts,tasks, notes, and Calendars with Outlook 2010. Do I need to buy a “Next Actions” WM6 product to sync GTD modules to my IPAQ?